My first week here at UCLA, I was eager to begin utilizing the amazing resources now at my fingertips: books, professors, and discussions composed of intelligent people who were eager, just like me, to begin a journey of self-discovery and learning. So, on a sunny afternoon during Week 1, I paid a visit to the arts library. As an art major, I made visiting the arts library a top priority. Photo books are a source of motivation and release and I find a lot of comfort in them. 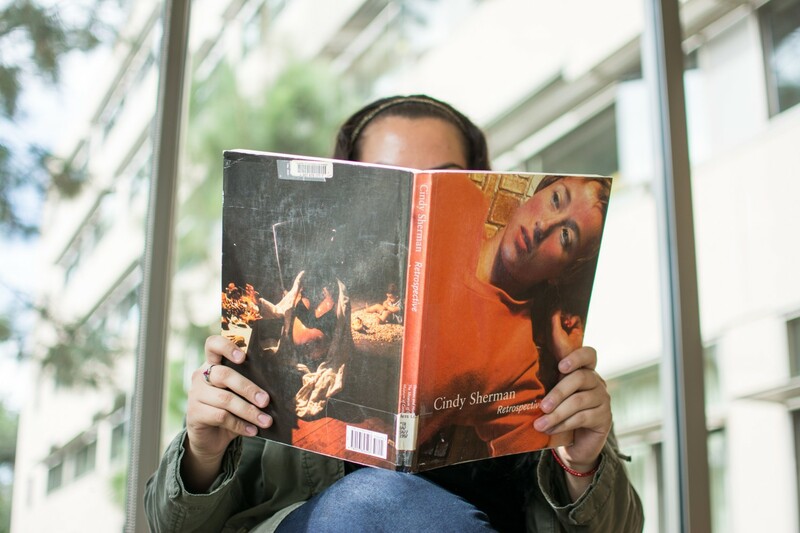 I scanned the long hallway of photo books, particularly hoping for a good selection of female photographers, and picked up three works, one of which was by famed fine art photographer Cindy Sherman. Cindy Sherman, a female photographer, is best known for her self-portrait projects where she takes on an array of human identities. She is well known in the photography community and has been someone I looked up to a lot, as a female photographer myself. The book has a collection of some of her most provocative projects. 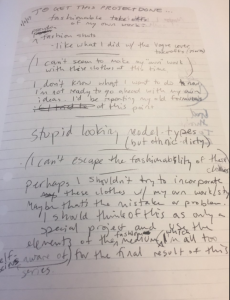 I reached a collection of scans of some of her photoshoot notes, when a line in her jumbled writing caught my eye. It took me a moment to comprehend what I had read. Was Cindy equating ethnic people to looking stupid…to being dirty? I googled “Cindy Sherman Racist” and was greeted with 685,000 hits. Among those were various articles on a photo series she did in 1976 titled “Bus Riders”, where she portrayed 15 different characters she saw at bus stops. Five of those characters were black, which she decided to portray using blackface. Upon viewing the nauseating images, I knew I had unfortunately discovered the classic trope white artists often use in their artwork. Time and time again, whether through orientalism, primitivism, or exoticism, white and western artists have used non-white identities as props: Gauguin and his works of Tahitian women, Matisse and his works of Moroccan women, Edward Curtis and Native Americans, are all classic examples of this worn out custom. In uncovering Sherman’s blackface portraits and ethnic offenses, I felt the beginning of a difficult journey for myself as an artist unfold. I began to reevaluate the female artists I considered admirable: Cindy Sherman, Sophie Calle, Imogen Cunningham, Dorothea Lange, Annie Liebovitz. They are all women who overcame the male dominant field of photography, but they are all white women. As a white passing Latina, I am aware of the privilege I have, but my connection to Latino culture is embedded in my soul. Because of this, I have always felt more connected to female artists of color. Unfortunately, women of color are rarely found in art education and history curriculum and art galleries. Carrie Mae Weems, Nikki S Lee, Wendy Red Star, Ana Mendieta, Yurie Nagashima, and Pun Ho Yun are the few female artists of color I have discovered through friends and digging deep on the Internet. They were absent from textbooks and lectures despite their impactful artistry. I still admire the white female photographers and the obvious talent and work ethic they have, but seeing the lack of women of color in photography is disheartening. I hope that the art community, here at UCLA and across the world, will join me in re-molding this unfortunate reality of art and photo history. All artists must come together and help elevate female artists of color, so that every young artist learning their craft can have the relatable role models I never had been taught. Gaby great article and I never realized women of color weren’t recognized as their white female counterparts. Thanks for bringing that to our attention so we can also open the road for these great artists.